BITCOIN CASH On The MovesteemCreated with Sketch. Bitcoin cash is seeing some of the best gains today. Additionally, we're seeing a bit of increased bull volume to follow, which is the most we've seen here in about two and a half weeks. Technicals seem to be favoring upside for the bulls, so this could be a very good thing. 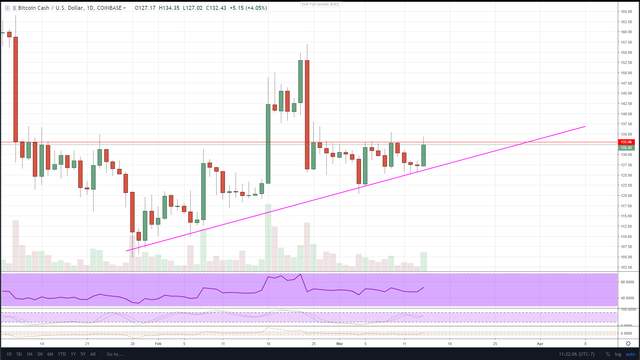 The ultimate test is going to be breaking and holding above the $133 resistance. This level has been most relevant, but unfortunately, didn't hold on the way down. It's sure proved to be a struggle for the bulls though, so hopefully, we'll be able to see them accomplish this task in the near future. Shorter charts have shown a lot of periods of bull volume, only to leave the bears in the dust wondering what's happening. Again, I'm very excited about this opportunity and prospect. The rest of the markets are still flat, so I believe that we will likely see another break of some sort here in the not-so-far future. Hope you're all having a great Thursday! !